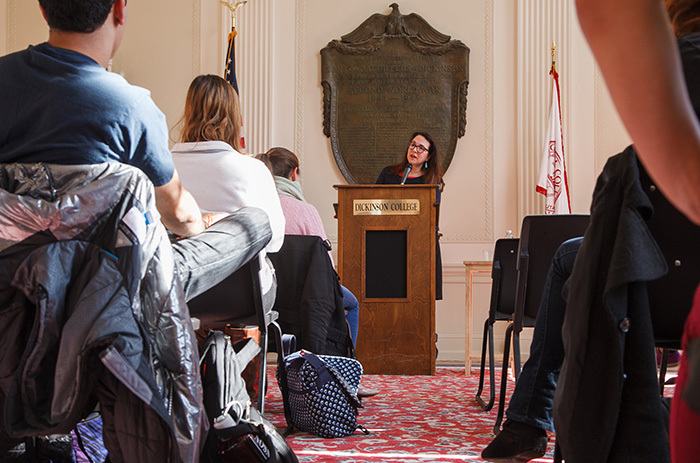 Stellfox Award-winner Lorrie Moore speaks with literature and writing students in Memorial Hall. Known for lending fresh perspective to ordinary events, Naomi Shihab Nye is a leading American poet. Her 19 Varieties of Gazelle: Poems of the Middle East (2002) and You and Yours (2005) explore poetic responses to 9/11. Other works include the Voertman Poetry Prize-winning Hugging the Jukebox (1982), Fuel (1998) and Transfer (2011). Nye, whose Palestinian heritage informs her American perspective, also writes essays, children's fiction and translations. John Patrick Shanley is the playwright of "Doubt," a 2005 Broadway production inspired by a relative's experience with a priest who was convicted of child molestation. The play won four Tony awards, a Drama Desk award and the Pulitzer Prize.Shanley also is a screenwriter and director of the 2008 film adaptation of Doubt, starring Meryl Streep and Philip Seymour Hoffman. His other screenplays include the 1987 film Moonstruck (Cher, Nicholas Cage), which won three Academy Awards, including best screenplay. Recent works, including "Outside Mullingar" and "The Prodigal Son," also have received critical acclaim. MacArthur Fellow and Stellfox Award-winner Edwidge Danticat is the author of several books, includingBreath, Eyes, Memory, an Oprah Book Club selection; Krik? Krak!, a National Book Award finalist; and Brother, I’m Dying, a 2007 finalist for the National Book Award and 2008 winner of the National Book Critics Circle Award for autobiography. Her most recent books include Mama’s Nightingale, a picture book, and Untwine, a young-adult novel. Known for humorous, poignant and unsparing short stories, Lorrie Moore is the recipient of the Irish Times International Prize for Literature, a Lannan Foundation fellowship, the PEN/Malamud Award and the Rea Award. Moore's fiction and nonfiction have appeared in The New Yorker, Harperʼs, The New York Review of Books, The New York Times, The Paris Review, The Yale Review and Best American Short Stories. Her most recent novel was a finalist for the PEN/Faulkner and the Orange Prize. Moore is a member of the American Academy of Arts and Letters and has taught at Cornell University, the University of Michigan, New York University, Princeton University and Baruch College and, for 29 years, at the University of Wisconsin. She is currently Gertrude Conaway Vanderbilt Professor at Vanderbilt University. She grew up in upstate New York and received her B.A. from St. Lawrence in 1978. Muldoon's residency was punctuated by a lecture and award ceremony, a theatrical production and two major musical performances. Each related to Muldoon's life and work and/or to that of the poet's longtime friend and mentor, Seamus Heaney, who was named the 2013-14 Stellfox recipient before his sudden death last fall. "The Icing Is Not the Cake"
"Richard Russo to Receive Stellfox"
Novelist, playwright, essayist, journalist, literary critic and 2010 recipient of the Nobel Prize in Literature. 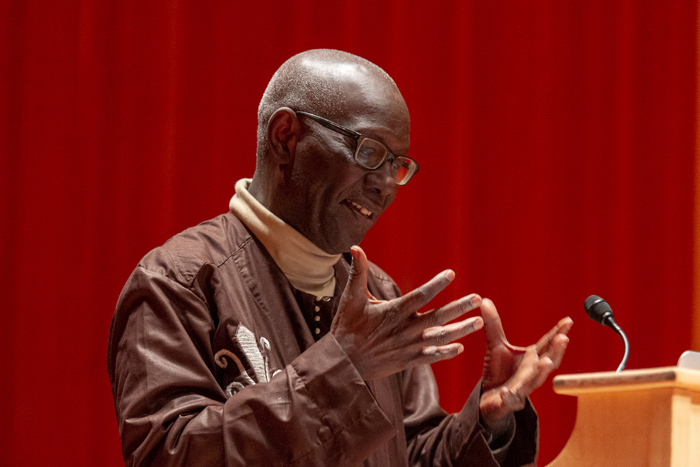 Major writers and poets come to Dickinson through the Stellfox program, serving weeklong residencies uniting students in literature, writing, languages and the arts for energized workshops, informal meetings, performances and other public events.